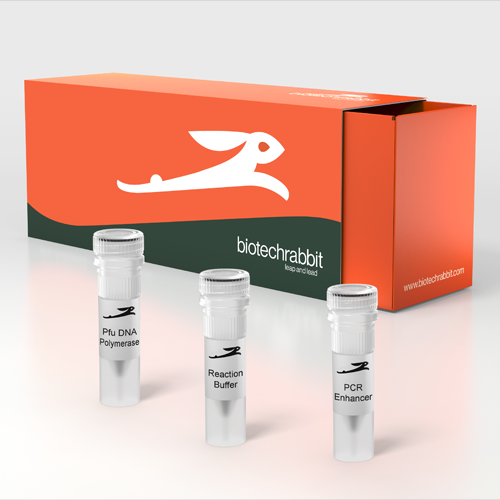 biotechrabbit™ Pfu DNA Polymerase is a highly purified thermostable recombinant proofreading DNA polymerase. 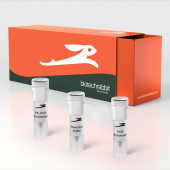 Pfu DNA Polymerase exhibits approximately 10 times higher accuracy than Taq DNA polymerase and amplifies targets up to 3–4 kb in size. The enzyme catalyzes template-dependent nucleotide polymerization in the 5'→3' direction. Additionally the 3'→5' exonuclease (proofreading) activity corrects nucleotide incorporation errors, thereby increasing fidelity and accuracy of DNA polymerization. The enzyme has no 5'→3' exonuclease activity and no detectable reverse transcriptase activity and produces blunt-end PCR products. 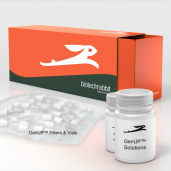 For the most demanding applications, the supplied 5× PCR Enhancer can be optionally used for improving results when using templates with GC-rich sequences and complex structures. One unit catalyzes the incorporation of 10 nmol of deoxyribonucleotides into a polynucleotide fraction in 30 minutes at 72°C. Human genomic DNA was amplified using the DNA Polymerase and specific primers to produce a distinct band of 750 bp. 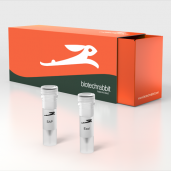 Standard PCR is carried out without primers, using the DNA Polymerase and human genomic DNA. 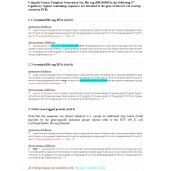 No products were amplified. Linearized lambda/HindII fragments are incubated with the DNA Polymerase in a 50 µl reaction mixture for 4 h at 37°C. No degradation of DNA was observed. lambda DNA is incubated with the DNA Polymerase in a 50 µl reaction mixture for 4 h at 37°C. No degradation of DNA was observed. Supercoiled plasmid DNA is incubated with the DNA Polymerase in a 50 µl reaction mixture for 4 h at 37°C. No conversion of covalently closed circular DNA to nicked DNA was detected. A sample of the denatured DNA Polymerase is analyzed with specific primers targeting the 16S rRNA gene in qPCR for the presence of contaminating E. coli DNA. 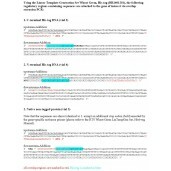 No E. coli DNA was detectable. If unspecific amplification occurs, the amount of DNA Polymerase and the primer concentration can be reduced. Correspondingly, these can be increased when yield is low. Thaw on ice and mix all reagents well, especially the MgCl2 solution and dNTPs.